John Roberts is entering the stretch run of his tenth term as chief justice of the United States. In-depth assessments will come, but the preliminary results are plain. The man who vowed to act as a neutral umpire calling balls and strikes has led a Court in which racial and religious minorities, women, workers and consumers have struck out regularly, while the economically and politically powerful have walked around the bases. The chief justice has emerged as a cunning strategist and leader willing to defy the customs and traditions that buttress the Court’s legitimacy. He has led a Court that has repeatedly overreached by taking cases it does not need to hear, answering questions not squarely before it, and ignoring or overruling longstanding precedent—all in the service of deciding the issues that the conservative majority wants to decide, in the manner it wants to decide them. Roberts has been aided in this effort by Justice Samuel Alito, who joined the Court just months after Roberts and has written some of the most radical decisions of the past nine years. 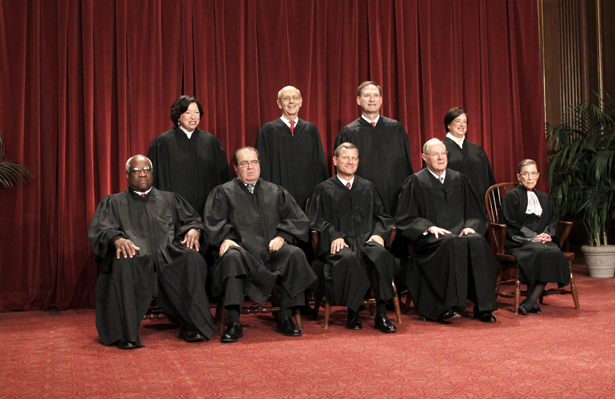 The Court’s march to the right has occasionally been interrupted by the defection of Justice Anthony Kennedy from the conservative majority, resulting in decisions striking down the Defense of Marriage Act and limiting death sentences for low-IQ defendants as well as life imprisonment for juveniles. But even when the chief justice has split with his conservative colleagues, as in upholding the Affordable Care Act (ACA), he has often exacted an enormous toll—in the latter instance, with a ruling that the expansion of Medicaid was fully optional for states. That ruling has deprived millions of affordable healthcare. In that same case, Roberts employed a recurring technique that has served a right-wing agenda while appearing reasonable. When upholding the ACA as a tax, he wrote an opinion severely—and without precedent—narrowing the scope of congressional power to regulate interstate commerce, a power that has been crucial to upholding social-welfare and civil-rights legislation. The chief justice used the same tactic in 2010, when he convinced seven other members of the Court to sign on to a narrow opinion that laid out the grounds on which the conservative members of the Court would subsequently gut the Voting Rights Act. The chief justice has also pursued his agenda by telling the pitcher what to throw. In Citizens United, the Court initially heard arguments on a far more modest case, then ordered the parties to prepare briefs for a broader constitutional attack on campaign-finance restrictions and the Court’s own precedents. After re-argument, the Court issued its sweeping ruling in favor of the position it had told the petitioners to take. The sad irony is that, rather than serve its traditional role as the institution of government where those shut out of the political process can find a voice, the Court has used its rulings to strengthen the already deafening voices of the wealthy and powerful. At the same time, it has insulated itself and the lower federal courts from the pleas of the politically disfavored by slamming shut the courthouse doors. Here is a list of ten areas in which the Court has failed those Americans most in need of its protection. § Business: The Roberts Court has made Mitt Romney’s statement that “corporations are people, my friend,” a central component of its jurisprudence. It has imbued corporations with the right to religious expression, as well as the right to free speech through political advertising and unlimited political spending. Spurred on by an elite Supreme Court bar largely in the service of wealthy corporate clients, the Roberts Court has become the most pro-business Supreme Court in generations. According to a study written in part by conservative Seventh Circuit Judge Richard Posner, the five conservatives on the Roberts Court are all among the top ten most pro-business justices since 1946—with Alito and Roberts ranking first and second. § Workers’ rights: Justice Ruth Bader Ginsburg wrote in 2013 that the majority of the Court “is blind to the realities of the workplace.” That blindness has manifested itself in decisions limiting government employees’ free speech and collective-bargaining rights; barring Lilly Ledbetter’s claim for decades of pay discrimination; raising the bar for proving age discrimination; preventing more than 1 million Walmart employees from having their day in court to allege gender discrimination; limiting the availability of overtime pay; redefining “supervisor” to allow employers to avoid liability; and making it more difficult for employees to prove retaliation by their employers. § Voting rights: The Roberts Court ripped the heart out of the Voting Rights Act in Shelby County v. Holder. In a stunning display of judicial hubris, the Court dismissed the 15,000-page congressional record in support of the act, as well as the language of the Fifteenth Amendment, which empowers Congress to enforce the right to vote free of racial discrimination. The decision was the culmination of a career-long mission by the chief justice to undermine the act, which he fought to limit as a young lawyer in the Reagan administration. And it has unleashed a torrent of state voter-suppression measures that target African-Americans, Latinos, the poor and the young. § Reproductive rights: Perhaps the most striking example of how the makeup of the Court affects its decisions is the area of reproductive rights. In 2007, a majority of the Court upheld a ban on so-called partial-birth abortions that was virtually identical to the ban struck down only seven years earlier—before Justice Alito replaced Justice Sandra Day O’Connor. The same five-justice majority held that the religious rights of employers trumped women’s right to receive comprehensive health-insurance coverage, including coverage for contraceptives. § Guns: The Court struck a blow against those living in communities plagued by gun violence when the majority held for the first time that the Second Amendment provides an individual right to gun ownership and struck down the gun-violence-prevention laws enacted in Washington, DC. This “law-changing decision,” in the words of then-Justice John Paul Stevens, upended decades-old Supreme Court precedent on which hundreds of judges had relied. § Religion: The Roberts Court has drawn sharp lines favoring believers over nonbelievers and majority believers over minority believers. The Court has upheld the practice of beginning town meetings with a (Christian) prayer, denied taxpayers standing to challenge a public-subsidy program that gave money to private (Christian) religious schools, and reversed a decision prohibiting the display of a cross in a federal park. Also, as Justice Ginsburg wrote in her Hobby Lobby dissent, “In a decision of startling breadth, the Court holds that commercial enterprises…can opt out of any law (saving only tax laws) they judge incompatible with their sincerely held religious beliefs.” In other words, they can impose their religious views on the rest of us. Although the Court’s docket for its tenth term is not yet complete, it already includes cases that could deprive some 13 million low-income Americans of the subsidies they need to afford health insurance; affect whether as many as 8 million LGBT Americans in thirty-three states can marry; dilute the power of minority voters; permit employers to force women to choose between healthy pregnancies and their jobs; and make it much more difficult to remedy housing discrimination. John Roberts turned 60 in January. Because of lifetime tenure, we may be looking at another two decades or more with Roberts as chief justice. But two of his fellow conservative justices—Scalia and Kennedy—are 78. It is likely that the next president will nominate their replacements, as well as those for 81-year-old Ruth Bader Ginsburg and 76-year-old Stephen Breyer. The 2016 presidential election is likely to determine the Court’s direction for at least a generation. Will it be a Roberts Court in which the chief justice is consistently in the majority, or will it be one in which Roberts plays the role of dissenter as he watches a progressive majority remedy the damage of his first decade? The voters will decide.